You have at some point registered to receive this newsletter via one of the Online Bible sites. In past years, this newsletter has not been sent on a regular basis. Importantia Publishing, this newsletter’s publisher, is still active within the field of content development for Online Bible applications. Due to reorganisation of these activities, improved content will be developed for use on the Online Bible in the coming years. In order to make this possible, control over the technical aspects of the Online Bible applications have been passed on to Cross Link Services. In this way, Importantia can fully concentrate on biblical content development. This newsletter will also appear more regularly and with more polished content. We aim to produce one to two newsletters per month, as well as the occasional ‘special’ newsletter. The information contained within this newsletter will include developments in the field of Bible-related publications on which Importantia is currently working. Reports will be also be made regarding the availability of texts on the Online Bible. We are happy to provide you with this service and are open to your comments and questions. Should you have a particular request as regards this newsletter, we would like to hear it. 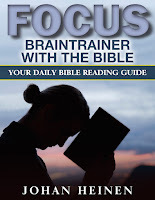 In the previous newsletter we announced the publication of a new book: Focus Braintrainer with the Bible. This is a guide to reading the Bible. We were subsequently asked if this guide will also be made available for the Online Bible. Answer: We certainly plan to; however, we are unable to say when this will happen. First, the Kindle promotional period must have passed. During this period, according to our contract, no other digital edition may be made available. We chose this promotional period as it means the book, ‘Focus Braintrainer with the Bible’ is available for a low price, making it available to a much wider audience. This wonderful tool for bible study is now available in Kindle format for $0.99. This guide has been consciously under priced, but in order to increase public awareness of the book and to allow an even greater public to profit from its guidance when reading the Bible, we would appreciate your objective reviews on Amazon. Please help us by adding your review. This book (and eBook) describing the history of Christianity has been available via Importantia Publishing for a number of years. The Kindle edition has recently been reduced in price to $2.99. This book offers an extremely clear overview of the history of the Christian faith. The author, Benno Zuiddam, has written this book in order to increase the reader’s understanding of the present day Western church by learning more of its history. It is currently not available for the Online Bible. Prof. Benno Alexander Zuiddam holds doctorates in Theology and Classical Studies. He is professor (extraordinary associate) for New Testament Studies, Greek and Church History at North West University (South Africa) and Greenwich School of Theology in the U.K. I find the introduction of our fresh newsletter format exciting. This newsletter has many subscribers, but I rarely had the time to give it the attention it deserved. Thanks to the handing over of the Online Bible applications to Cross Link Services, I now have the time and opportunity to dedicate more time to it. I am also able to give more attention to those projects involving the making available of new content for both biblical studies and biblical research. Not only for the Online Bible, but also in other forms of publication. I’m very much looking forward to keeping you up-to-date via this newsletter. A little more about myself: I was introduced to Online Bible software in 1990 and spent much time developing content specific to this software in various European languages. In 1992 I established Importantia, an engineering firm, so that I could continue working on the Online Bible in Europe full-time. As this transition into the development of Bible-related content was at first a relatively slow process, the word ‘Publishing’ was only added in 1998. All developed content was exclusive to the Online Bible. However, in 2002 I also began to publish books and - later - eBooks. Emphasis is being increasingly placed upon content development and publishing, where the Online Bible plays an important role. As from this year, I have handed over Online Bible matters to Cross Link services, which gives me the opportunity to fully concentrate on content development. The Online Bible remains an important form of publication. Three years ago, as a further means to develop quality content, I started a course leading to a Bachelor of Theology. I am married, with two grown-up daughters.